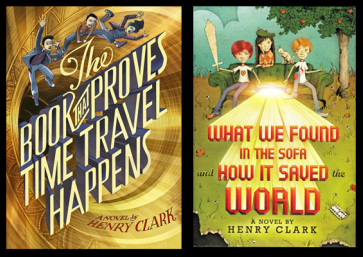 Books by Henry Clark - Maintained and Sporadically Updated by the Author. SEVEN MINUTES A DAY WHEN MAGIC WORKS. The trick is, figuring out which minutes they are. Seven Minutes of Magic is the third book in Henry Clark's monumental Totally Unrelated Trilogy, a group of three books which, through extensive outlining, painstaking story-boarding, and meticulous Venn-diagramming, have absolutely nothing to do with each other. The other two books are What We Found in the Sofa and How It Saved the World and The Book That Proves Time Travel Happens. They can be read in any order, although reading any of them back-to-front can be somewhat confusing. Seven Minutes of Magic will be published by Little, Brown, in the spring of 2020. Start counting the minutes. Webmaster: Guernica. Last updated: April 1, 2019 06:41 EST.